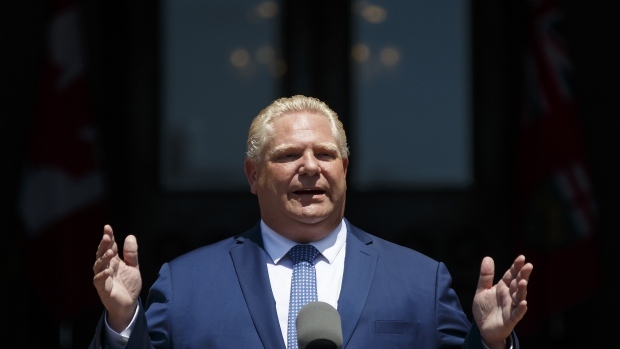 TORONTO -- Ontario Premier Doug Ford said Monday his Progressive Conservative government would invoke a rarely used notwithstanding clause in order to go ahead with its plan to cut the size of Toronto city council despite a court decision that ruled the move unconstitutional. The premier said the province would also appeal the court decision, which said the legislation -- called the Better Local Government Act -- was hurriedly enacted in the middle of a municipal election and interfered with the right to freedom of expression for both candidates and voters. "I believe the judge's decision is deeply, deeply concerning," Ford told a news conference. "The result is unacceptable to the people of Ontario." Ford said he'd be recalling the legislature this week to introduce legislation that will invoke the notwithstanding clause, which gives provincial legislatures or Parliament the ability, through the passage of a law, to override certain portions of the charter for a five-year term. "There is no evidence that any other options or approaches were considered or that any consultation ever took place," Superior Court Justice Edward Belobaba wrote in his decision. "It appears that Bill 5 was hurriedly enacted to take effect in the middle of the city's election without much thought at all, more out of pique than principle." Bill 5 cut the size of Toronto's city council from 47 seats to 25, aligning them with federal ridings, despite the fact that the campaign for the Oct. 22 municipal election was already underway. Toronto city staff said they will proceed with the election on the basis of a 47-ward structure and it was unclear how Ford's response would affect those plans.